Red Lobster cheddar bay biscuits copycat – close to the original Red Lobster’s biscuits. Crumbly, cheesy, and the best biscuit recipe ever!! This Red Lobster Cheddar Bay Biscuits recipe was originally published on May 5, 2007. Truth be told, I am a food snob. I shun away from chain restaurants—Cheesecake Factory, nah; The Olive Garden, meh; Denny’s, are you kidding me?! So, you have it, I am a food snob. I avoid going to franchise or chain restaurants at all cost, well, unless I am starving or stuck in the middle of nowhere and the only restaurant in town is Applebee’s. Somehow, the notion of a huge restaurant empire scares me. I am afraid they are going to take over the world and infest the dining scenes with the likes of Planet Hollywood (are they still in business?) and Rainforest Cafe. I yearn for pure culinary originality and I champion epicurean creativity. Dining out is one of the most enjoyable and best things in the world, so a restaurant should be unique, possesses lots of character, and has its own identity (no cookie-cutter decor and menu, please!). However, I have to admit that there is an exception. I go to Red Lobster, occasionally. As a seafood connoisseur, you must think that I go there for seafood, but no, I go there for the sole reason of stuffing myself silly with their biscuits. 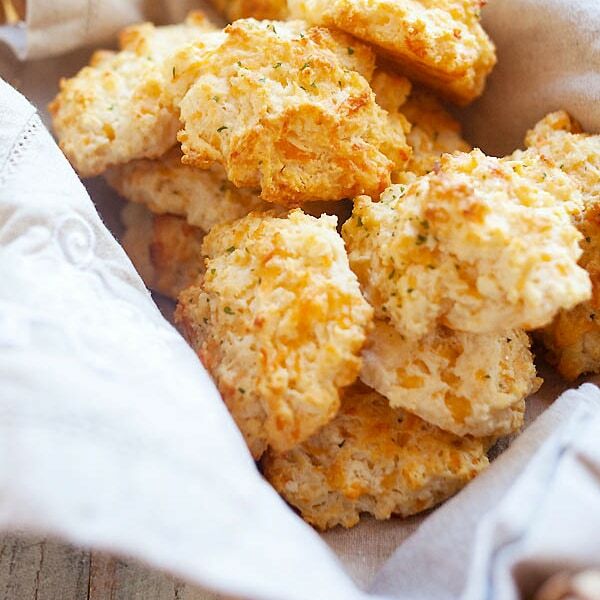 Yep, you heard it right—those fluffy-cheesy-buttery-garlicky-fresh-off-the-oven world famous Red Lobster biscuits. (Red Lobster serves almost 1.1 million of their Cheddar Bay Biscuits every day.) You have the statistics, they are spectacular! Wait a minute, didn’t I just proclaim that I don’t do chain restaurants? I can’t lose my integrity, but I am nuts for Red Lobster biscuits. I made them, well, after hours of Googling for the secret and copycat recipe of Red Lobster Cheddar Bay Biscuits on the internet. I don’t think I got the real “secret” recipe for Red Lobster Cheddar Bay biscuits, but they were pretty darn good. In fact, they were about 85% close to the original in terms of taste and texture. That’s very good for a knock-off. Disclaimer: This post was written in a deliberate tongue in cheek tone, and voices my personal preferences and opinions. If you love chain restaurants, please don’t get offended. Red Lobster cheddar bay biscuits copycat – close to the original Red Lobster’s biscuits. Crumbly, cheesy, and the best biscuit recipe ever!! Preheat oven to 450 degree. Mix biscuit mix, milk, and cheddar cheese until soft dough forms; beat vigorously for 30 seconds. Drop dough by spoonfuls onto ungreased cookie sheet. Bake for 8-10 minutes or until golden brown. Mix melted butter, garlic powder, and dried parsley; brush generously over warm biscuits before removing from cookie sheet. Serve warm. Make 10-12 biscuits. Congratulations. Just read your recipe for Stir Fried Bean Curd with Leek in Food blogs in the Sunday Metro/The Star. Been searching for Red Lobster around my area so that I could try ..er….the lobster. So, when are you opening a restaurant? Heyyo…when I read in the local newspapers just now and saw a restaurant Rasa Malaysian just opened (to replace the previous Penang Village), I thought it’s you leh! How come not you? Tiga thought Rasa Malaysia came over! Hey there, how’s the cheese taste in this recipe? I mean is it really strong taste of cheesy cheesy biscuits or just a hint of cheese? I am not a cheesy person (pun not intended), you see. I just made these and I used sharp cheddar and it isn’t strong at all but that’s just my opinion. You could always try it in a 1/2 batch and if it’s too strong for you then use the mild. haha yes i avoid chain restaurants when i can..unless its pretty good..
yeap i saw ur article..good job! Huh? Is there an article from Rasa Malaysia?? I like the way you write and the pictures that you take. It’s so nice and tempting. wondering a quarter cup of butter is how many stick? melted a quarter teaspoon of garlic? how? thank you. by the way the pictures is real good. have u tried before? just want to tell you ….you are inteligent. a stick of butter is 1/c, so a half stick is 1/4 cup. ( 4 tablespoons) Where I come from , all this is marked on the paper the stick is wrapped in. Lovely pics. They look so yummy too. I’m hungry lar. hey, the lightbox feature is cool! btw RM, yes saw your blog (one post) being featured in the star paper today. Tigerfish – hey, don’t get me wrong, I just don’t go to chain restaurants that much because of personal preference. For the same kind of money, I can eat at little restaurants. Aiya, can I sue Rasa Malaysian because they stole my TM, oh well, they are smart to add an “n” to the name!! Joe – yes, me too, unless it’s really really good then I will try. Red Lobster’s seafood is not bad, but I prefer Chinese-style seafood because Red Lobster they mostly just boil or deep fry the seafood. Stephanie – Yes! That’s why I said I didn’t find the real secret recipe. From the Reb Lobster’s website, it looks like they make everything from scratch so they must have their own proprietary biscuit mix. New Kid on the Blog – LOL, I love your online moniker. Too funny, you had me at “Hanging Tough!” Hahaha. Thanks for your nice comment. Claude – Merci! I can take you to Red Lobster! LOL! Lucia – I know, I spent the whole afternoon doing the code, hard work, I am glad it works now. Yeah, the article but I didn’t really submit my article to them and didn’t know until Allen and Nigel tipped me. Haha, I know lah! Personally, I also prefer small little eateries with their own unique “character” and personality. Yest. was just at a small ramen shop opened by a Jap chef who is also a surfer. The whole eatery was managed by Japanese…very authentic! And love it! Aiya…I am really waiting for Rasa Malaysia to open one day. WHen? OMG!!! my hubby loves this Red Lobster biscuits!! Hi Rasa Malaysia: Your blog has been improving by leaps and bounds … I am impressed and wanted you to know that! The pictures you took were perfect … I like it a lot. The lightbox … is so cool. BTW, I am “offended” by your food snob comments. :-) Just kidding. I am too much a cheapskate to avoid chain restaurants. He he he … I do think Cheesecake Factory is awesome! how come no lobster one in the ingredients? ok ok V too like original singular women ! but just like u chain ladies too ( can oso) if v re starving..
Just wanted to thank you SOOO much! These were my favorite biscuits growing up, but I’ve had some pretty bad experiences at Red Lobster’s, so I haven’t hat these in a while. This is a great recipe! Btw, 1/4 cup butter is half a stick. Also, FYI, http://www.cdkitchen.com , click on “copycat recipes” and u will be amazed as what’s out there! U r right tho…I also prefer Chinese style seafood vs Red Lobster. Thx!! We make these at home from time to time using a similar recipe. I think the trick is using Lawry’s Garlic Salt in place of the garlic powder. We have also found that experimenting with other types of cheeses and/or herbs take these little biscuits to an entirely different level and makes the ones at Red Lobster pale in comparison. The only downside about making them at home is having to wash the dishes… So yes, even though they taste better at home, we too will sometimes break down and go to “The Lobster” just for the biscuits. The recipe is online too! thanks for sharing this recipe. looks simple, maybe i’ll try bake this..:)..oh yeah, and congrats! As a college student many, many, many moons ago, Denny’s was our favourite early, early morning hangout joint for cheese cakes and coffee after a night of mugging for exams. Only place we could afford ;-). So Denny’s is kinda special for me, nice memories. Where’s the lobster in the recipe? All I see are cheddar and a biscuit mix. I love Red Lobster too. Actually, a friend and I love Olive Garden and Red Lobster. It’s not something we say out loud in public. I’ve had that recipe for months, just made them last night to go with some black bean soup. But I thought the mix looked a bit heavy and added a pinch of baking powder to make them a bit more fluffy. If this is as close as we can get to the real thing, I won’t be going to a Red Lobster any time soon. Of course I live in the middle of nowhere and there is no R.L. or ANY restaurants near here….I cook at home always. yummy you make me hungry! what a snob! j/k we hardly go to big chain restaurants. :D but we do eat at panera bread/chipotle but they aren’t considered restaurant/restaurants! no waiters. :D this looks tasty. and i love your new lightbox! very creative and nice pics. Oppss – No worries, they are not fattening one, so your hubby should be OK.
FBB – lobsters will be coming soon to Rasa Malaysia, stay tuned. Babe – nice chatting to you, no need lah, just go read it online. Team BSG – there are so many good restaurants in Malaysia, no need to go chain restaurants lah. Meiyen – Thank you. Yes, Allen and Nigel told me or else I wouldn’t know. Eileen – you’re welcome. Now you can make your own Reb Lobster biscuits. KM – thanks for the link! WMW – hopefully it will turn into something I wanted. Well, baby steps, hehe. SC – cool. Can you get the biscuit mix from KL? Ming – you are in Manhattan, right? They have Red Lobster in Manhattan? Anonymous – ooooh baking powder…yes, I love extra fluffy. Thanks for the tip. BC – thanks. Yeah, I love lightbox. Very neat feature. Hehe. They are really cute, especially with Lightbox – I think my kids will really like these (if I don’t put any parsley in…maybe paprika) – you can finally get bisquick here, so no excuse! hey, RM, whats the best substitute to bisquick biscuit mix, since we dont have it here? Hey, same feeling here. Red Lobster has the biscuit and don’t miss out on Sizzlers’ cheese toast. i love love love love Red Lobster yummilicious biscuits! I used to ta-pao the ‘complimentary’ biscuits home and slowly munch on it for the rest of the week:). Thank you so much for your wonderful recipe for the RL Cheddar biscuits. I must ask you, now, are you familiar with those great cheddar & garlic mashed potatoes that Red Lobster used to serve (and unfortunately removed from their menu)? If you could provide that recipe, we would be eternally grateful. Hi, Rasa. I found your post while googling for the recipe. I have made a cheddar biscuit recipe tonight, from the King Arthur baking book. I’ll probably bake them tomorrow to go with some shrimp and fettucine. Your pictures of the biscuits look amazing! I am a bit trashy when it comes to chain restaurants, though, and I have to admit, these biscuits are awesome! I’ve linked to your post on my blog post. Hope that is OK. I tried this recipe and it was wonderful! Passed it on to my family too! Thanks!! the red lobster biscuit taste really good and cheesy .it’s more like fry than baked.try using powder cheddar cheese and add a little more salt . if no milk was used and what is the liquid part? hmm… can the red lobster worker tell us ,pls? I am very sensitive to MSG and have found that most chain places use it like a main ingredient(RL’s scampi makes me very ill) thus I have had to become a bit of a food snob myself eating more local fare. My guess is that they use a version of the scampi broiling sauce to brush the bscuits with. It has a LOAD of MSG in it, so that would account for that hyper-flavoring on top. Whoever suggested lemon/salt/butter garlic combo is probably closest without resorting to Accent/MSG – which is not allowed in my house. I can’t wait to try (the biscuits) at home. Like you – they’re my FAV! I work for Red Lobster, and found the recipe from our site. -scrape each 1 1/2 oz scoop of bread dough against the side of bowl until you have 5 rows of 4 on each tray. -dip scoop in water occasionally to prevent dough from sticking to scoop. After baking I always see the bakers liberally spreading butter over the biscuits and sprinkling dry parsley over it. ha! Great Post and wow what a scone! To what Kathleen says about the RL biscuit recipe. The mix comes premade to the store, they just add cheese and water. It’s premade people! How do I know? My husband is a GM at RL! My husband loves RL cheddar bay biscuits but hate seafood. Now i can make these myself at home. Thanks for the cheddar bay biscuits recipe. juz want to say thnk you very much appreciate it…. for your recipe its really awesome..first time to make it they come out really good…i hope you can make preztel too…we big fan of preztel we always go in the mall spend $20 for preztel expensive…hard life rigth now we need tight on the money…i hope can make one…. Joyce – thanks for your sweet comment. I love pretzel too and will have to try making it sometimes. They look so pretty!! I second that. I hate chain restaurants. I avoid them. I havent been to Red Lobster since…. well, probably 7- 10 years ago. Ah but I do remember the biscuits. I am looking for the recipe. I think I will try these. Yes, these cheddar bay biscuits are pretty good. Here is my blog, it’s about finding the perfect Red Lobster biscuit recipe, so if you want to share your experiences, you are more than welcome there! Just linked you on our blog! Thanks for posting this recipe, and for the laugh. Since there are none in my area, I have been to Red Lobster only once since they began serving cheddar bay biscuits, and they were unforgettable. We wondered how many extra baskets we could request without being cut off. As a pretty good biscuit maker (I have baked professionally) I tried with some success to replicate them. I’ve gotten close. The laugh was when I saw the Bisquik in the recipe. Never liked using the stuff – everything comes out heavy because of the dried shortening. Call me a Bisquik snob – that I am. The secret to replicating these biscuits at home is to use all butter. Hi! I can understand the “hating” bisquick sentiment that biscuit making mama has, but in all honesty, at the RL kitchen, these come from a baking mix in a bag. The one thing that I see missing is the Old Bay seasoning in the butter. Add 1/4 tsp in with the other seasonings. That is what makes them cheddar BAY biscuits. This recipie looks amazing and I personally LOVE the Cheese Buns at LH. We don’t have bisquick in Oz, does anyone know what else I can use? Would pancake mix be the Australian equivilant? I love red lobster recipes. Bee, I have been reading your blog for a while now and somehow, I missed your post on Cheddar Bay Biscuits! I totally agree with you the sole reason why I go to Red Lobster is for the Biscuits. I’ve discovered that if you are friendly to the server and mention you love their biscuits, you can get up to four baskets. Now that I have your recipe, maybe I don’t need to spend all that money just to get biscuits. Looking forward to trying it next weekend! Four baskets? Wow, I only asked for second helping every time, I was too shy. LOL. I haven’t been to Red Lobster for a while and now I might have to go soon and asked for four!!! OMG just like red lobster biscuits. I love them I have made three batches since Fri.
thank goodness you don’t go to red lobster for the seafood because it’s terrible. From someone who lives in FL, frozen seafood is nasty :) But their biscuits? Yes please. I have played with a similar recipe for awhile and I have found that if you add a little bit of melted butter to the bisquick mix. It adds a nice buttery taste to them too. They taste alot more like the Red Lobster biscuits. Oh my! I am going to try this for sure. Thanks! Hi there, I find this recipe through googling, and I’m so glad I did! Along with discovering Biquick, these biscuits are so phenomenal, and easy to boot! I’ve moved home to KL 2 years ago after living in Dallas for 14 years. Red Lobster’s biscuits are something my husband and I miss like crazy!! Too bad we can’t find Bisquick here. May have to attempt to make them from scratch. Wish me luck!! The secret ingredient to Cheddar BAY Biscuits is Old Bay Seasoning to both the biscuit mix (1/2 tsp) and to the butter/dried parsley mixture you put on top(1/2 tsp). I’ve been on a biscuit kick lately, and these biscuits look like the perfect way to continue! I’m featuring them on Five Friday Finds this week too, so please stop by for a visit and grab a button while you’re there! I put a dash of Lemon Pepper in with parsley and it was just about spot on! Cook them in an iron skillet. It really makes a difference. Like Rebecca has mentioned above we dont have bisquick in Australia…is there a basic biscuit recipe i should use? these sound tempting just told my partner bout it and hes dying to chomp on some! Hey, I just tried this recipe and it backfired on me…the biscuits did not rise at all….followed everything step by step! I am not sure what happened but it’s always been successful to me and many have tried with success. I had to laugh over the Bisquik because I HATE using that stuff. It’s just as bad as Crisco. I agree with that other reviewer, the secret is unsalted BUTTER though, at room temperature. Maybe if I am really hungry, I might try this recipe. And I will turn a blind eye on the Bisquik. I’m a Malaysian stayin in Melbourne Australia, recipe looks great! What can irreplaceable Busquick with! Can’t wait to try! I don’t know, I have always used Bisquick. Is there an instant biscuit mix available in AU? You can use the equivalent? For those like me can’t get the Bisquick Mix. Hope this will help you all. Nadia, to make biscuits well you can’t over knead the dough. The milk you use has to be cold. It’s like in pastry making, you need cold water for a flaky pastry. I’ve not made these biscuits but I will try them; thank you Rasa Malaysia. My friend LOVES Red Lobster and particularly the biscuits. I saw these in my facebook wall feed and it caught my attention. You can make your own “Bisquick”. I have for years. It’s better to make it fresh anyway because the baking powder and baking soda get old and it’s reactive properties fade. The shortening in the mix can become rancid if not kept in a cool dry place also. I’ve found for a good Bisquick recipe you need flour, shortening, baking powder, baking soda, sugar and salt. The shortening makes for a better grain in baking than the oil. Sometimes I add powdered milk to make my dough taste different and to enhance cheese biscuits. And for those of you who are very into making your own basics you can make your own baking powder with baking soda, cornstarch and cream of tartar. There are recipes for that online too! I tried this today and it was a super hit..me and my hubby devoured one after another and finished the whole 14 CBB I made in one batch in minutes!! !..Thank You very much for the easy and quick recipe..
PS : Can I post the recipe in my blog ?? They now sell the actual Red Lobster Cheddar Biscuit mix at Sam’s Club. I just bought a big box about 10 days ago. I bought the biscuit mix at sam’s and had it tonight; they were so easy and just delicious. Will still try to make from scratch just to compare. \i bought mine in florida but am back in canada where sadly, there is no sam’s. the box makes 10 biscuit in each bag, and there are 3 bags, even the herb mix to melt in butter to spread over after cooking. I was at Sam’s club the other day and they sell the Red Lobster biscuit mix. I read the list of ingredients and it contained a long list of unfamiliar preservatives. I put the box back. I just made these. They are so good. Better than the ones at Red Lobster! Here is a biscuit mix recipe. mix together and store in a container. I used to go to Red Lobster just for their cheddar biscuit too! SAMs club is selling Red Lobster biscuit mix for $5. Depending on the size you make them, you can make up to 32 biscuits. 3 individual bags per box. I made several batches already and they taste exactly like them. So yummy hot out of the oven. That’s great that you got your man hooked! This is too funny! My husband LOVES these biscuits too and bribes me to go to Red Lobster by saying “Do you want a big lobster tail for dinner tonight?” He knows that’s the only way I’ll go because I don’t care for their food. And all he wants are the biscuits, he could skip dinner altogether. So we’ve decided we’ll just go for drinks and biscuits. And I’ve used this recipe, works great! Tia – yes, their seafood is bad but I love their biscuits. Drinks and biscuits sound like a wonderful idea. Hi, I don’t have access to Bisquick biscuit mix (I live in Peru), how do you replace that in the recipe? Thanks! Hello Bee, you have never claimed to be a baker, however, I always try your recipes because I know that you always test it before you print. I do have one concern about the use of Bisquick. Bisquick contains Trans-Fat. Trans-Fat is worse than Saturated fat. Our bodies cannot process the Trans-Fat so it is stored in the fat cells. Once it is in the fat cell it will never come out. Shortening is also Trans-Fat. If you insist on nice flaky biscuits use shortening. I always did until I learned about Trans-Fat. Now I use butter. The biscuits, and pie crusts, are denser but our bodies can metabolize the saturated fat and get it out of the fat cell. I am going to try rendering my own lard from pig fat and try that in place of shortening. I would suggest making your own biscuit mix from one of the recipes in the comments section and replace the shortening with non-hydrogenized lard. I know Bisquick is faster, but it is not healthier. I had not heard the news about Red Lobster and hope it is not true. I feel the same way about their biscuits as you. I talked to a server about them once. Someone makes a mix exclusively for Red Lobster. If they run out of mix they use Bisquick! I wonder if their regular mix has transfat. I also love their Caesar salad. Would love to try this recipe but may I know what is this bisquick biscuit mix? What is the next best to replace this if I couldnt get this in Malaysia.Thanks. IBisquick is kind of a premade mix, but i found a substitute for it: just mix 1 cup flour, 1½ tsp baking powder, ½ tsp salt, and 1 tbsp oil or melted butter into a mixing bowl. The biscuits have the right flavor but are too ‘heavy’…not lightweight and airy like Red Lobsters. My husband thinks that whipping up that gluten or whatever may cause this but is still puzzled. Don’t know how to make the biscuit airy and light like RL does. In order to get a good, fluffy texture that is very similar to Red Lobster’s, you need to mix the dough by hand, and instead of melting the butter, you should cut it in with a pastry cutter or a couple forks, whichever you have on hand. It’s pretty messy, but the results are fabulous. I Hope this helps :)! Try using Pioneer Biscuit mix instead of Bisquick. They will produce a more fluffier biscuit. The instructions state to beat the dough which causes toughness. Mix thoroughly but gently with a fork, then drop by tablespoonful onto cold baking sheet, ungreased. handle the dough as if you were making scones. #1. They are called Cheddar BAY biscuits because of the cheddar cheese and the OLD BAY seafood seasoning included in them. Add 1/2 to 1 teaspoon of Old Bay seafood seasoning to them. Instead of Bisquick try Pioneer Baking Mix. They create a fluffier biscuit and don’t have the “bisquick taste”. I don’t mind making them from scratch, but I will definitely check out Pioneer baking mix for those times that I need a mix. It would be great to find something that tastes better. Thanks! Bisquick is just self rising flour with a bigger price on it. Re:Other recommendations for a lighter biscuit. My grandmother made the lightest biscuits ever and I recently saw a cooking show on TV that enlightened me as to how she did it. She put the dry ingredients into a big bowl and made a hollow in the center. Then she put the shortening (LARD) in the center of the hollow and poured the buttermilk over the lard, and then used her fingers to mix the lard and buttermilk together pretty good. Only then, did she start pulling the flour mixture in from the sides of the bowl to work it into the lard/buttermilk mixture and stopped as soon as she had enough of the flour mixture worked in, to be able to handle the batter and shape the biscuits. You might have to do this a few times to get the right feel for it,but it will be worth it. Those southern women do know how to do biscuits. > Would evaporated milk makes it denser? – Leave the dough to stand for 15 mins (I find that this makes the texture more chewy). People in the comments say to cut the butter in or do other things with the butter, but the butter doesn’t go in the batter, it goes on top of the biscuits after they are baked! I’ve tried this recipe along with many others. All were just ok. I finally found “the one”! I make these all the time and I think they are at least 95% close to Red Lobsters. Try, you won’t be dissappointed! Melt 2 Tbs butter add 1/4tsp garlic salt, finely minced parsley brush on warm biscuits right out of the oven. Where can I buy Bisquick baking mix in Malaysia?